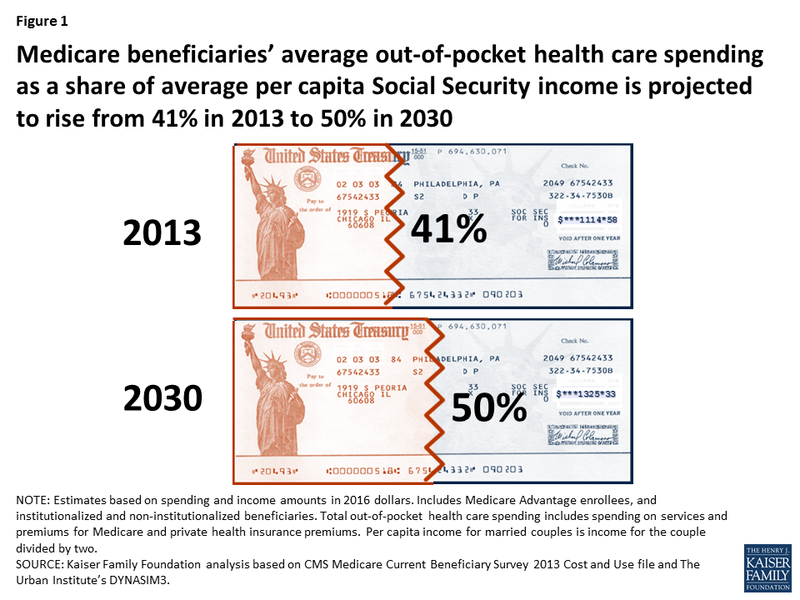 Medicare beneficiaries’ average out-of-pocket health care spending is projected to rise as a share of average per capita Social Security income, from 41 percent in 2013 to 50 percent in 2030 (Figure 1). Half of beneficiaries in traditional Medicare spent at least 14 percent of their per capita total income on out-of-pocket health care costs in 2013. The spending burden was higher for people ages 85 and over, in poor health, and with modest incomes. More than one-third (36 percent) of beneficiaries in traditional Medicare, and half of those with incomes below $20,000, spent at least 20 percent of their per capita total income on out-of-pocket health care costs in 2013. By 2030, more than 4 in 10 (42 percent) traditional Medicare beneficiaries are projected to spend at least 20 percent of their total income on health-related out-of-pocket costs.